Americans need to speak up against anti-Muslim language and actions. Hatred of the “other” in America is on the down slope. We still have some way to go, but we’ve come a long way since “No Irish need apply” for employment, gays and lesbians barred from teaching,lily-white major league baseball, and deed restrictions against selling houses to Jews. Heck, we even elected an African-American President. It seems like the only minority it’s ok to hate is the Muslims. Ann Coulter’s many fans laughed when she said that Muslims should not be allowed to fly on airplanes and should take “flying carpets” instead. When a Canadian Muslim student protested that she did not, in fact, own a flying carpet and asked how she should travel, Coulter’s rejoinder was “Take a camel.” Haha. “At this point, they will work to get the ruling government to allow them to rule themselves (within their ghettos) under Sharia, the Islamic Law. The ultimate goal of Islamists is to establish Sharia law over the entire world. The terror is said to get worse as the number of Muslims increases, through sporadic killings, and the burnings of Christian churches and Jewish synagogues at 20% and widespread massacres at 40%. This is pretty vile stuff. And scary. If it’s OK to cast such aspersions against Muslims today, what about tomorrow? What about Jews?African Americans? Gays? Latinos? Americans need to speak up strongly against anti-Muslim language and actions. This entry was posted on April 9, 2010 at 8:02 am and is filed under Ethics-general, International, Tolerance. You can follow any responses to this entry through the RSS 2.0 feed. You can leave a response, or trackback from your own site. 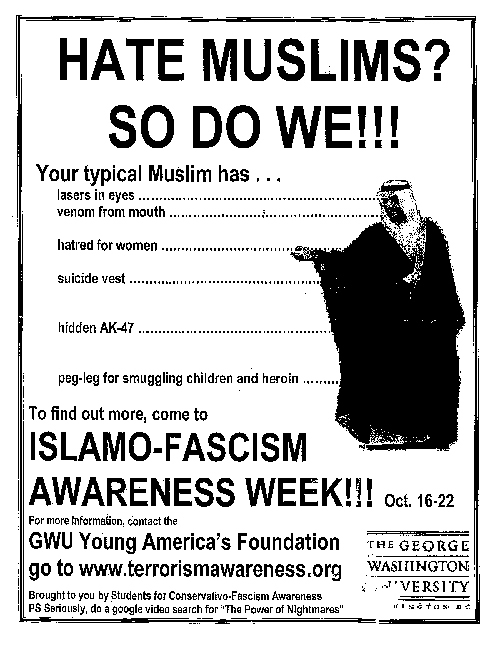 Bob, you are right to address the wave of anti-Islamic hate mail. The sample you gave is filled with lies and distortions, intended to frighten people. None the less, there are sections in the Quran which are troubling to Jews and Christians. These, too, will need to be addressed to build bridges. Here is an example: “Ye [Muslims] are the best of peoples, evolved for mankind, enjoining what is right, forbidding what is wrong, and believing in God. If only the People of the Book [Jews and Christians] had faith, it were best for them: among them are some who have faith, but most of them are perverted transgressors. (The Noble Quran 3:110)”. This translation is from http://www.answering-christianity.com/marriage_islam.htm, and is consistant with the Shia Koran I got at a mosque. If Jews and Christians are troubled by passages from the Quran they should look to their own scripture. The Quran can criticize Jews and Christians because they came before it. Had the Quran predated the Old Testament, no doubt the latter would have God ordering the Jews to slaughter the Muslims. As it is, the Old Testament tells us, in Deuteronomy, that the Israelites—at God’s direction—killed all the Heshbonites and Amorites in sixty cities to take their land. Much later Christians elevated the art of God-blessed killing in the Crusades to recapture Jerusalem from the Muslims. Along the way for good measure, they managed to slaughter tens of thousands of other Christians who practiced their Catholicism under the administration of the Eastern Church, instead of following the “true” direction from Rome. Today most serious Muslims don’t consider Jews and Christians to be perverted transgressors. Some do, just as some Jews believe that God gave them land tended by Arabs for centuries, and just as some Christians believe that Jews need to be perfected through conversion. But for the rest of us let’s let ancient history be ancient history. I am a Christian. I don’t believe it is acceptable to hate anyone. Even one’s enemies. Freedom of conscience and the right to select one’s religion should be a universal right. Sadly, it is not. Regardless of what CAIR promotes and says, the reality is, in Muslim dominated nations, oppression and persecution of anyone not believing EXACTLY as required is severe. You need look no further than these nations to know what Islam is about. It is exactly where Muslims intend America to go. Think EXACTLY as they do or get snuffed out…. I am not kidding and you all know what I mean. Look up Pastor Youcef Nadarkhani’s situation in Iran if you don’t believe me. Iran’s constitution guarantees freedom of religion. It’s all nothing but a window dressing for the rest of the world. Islam = oppression for the infidels……. Jim, I’m glad you don’t believe hate is acceptable. but you’re wrong about “Muslim dominated nations.” Some, like Saudi Arabia, discriminate against non-Muslims and insist on orthodoxy among Muslims. But it’s a matter of the Saudi government, not Islam. In Turkey and Indonesia, for example, Christians and Jews are free to practice their religions as they please, and Muslims are free to be observant or completely secular. I have visited Turkey many times, been driven around by Muslim women friends, drunk alcohol, and attended Sabbath services at several synagogues. Your gripe is with a few despotic governments, not with Islam.